Smithfield Church of God in Christ located in Birmingham, Alabama, was organized sometime between the late 20’s or early 30’s (possibly 1932), under the leadership of Bishop Riley Felman Williams. The Church began with less than 5 members that came with him from East Birmingham. They went first to 824 Charles Street in Smithfield to a church building that was called the Tabernacle. They stayed there until the government bought the land for housing projects, then moved to a storefront on Graymont Avenue in Smithfield. While at this location, members purchased land on the corner of 1stStreet and 4thCourt North and later put up a tent. They remained there until a storm demolished the tent, then went back to the storefront. While at the storefront a church was built on 1stStreet. Upon completion, the members marched in one Sunday morning from the storefront to 4thCourt and 1stStreet North, singing praised to God. Bishop R.F. Williams and Elder S. Skanes were the pastor and co-pastor. The church grew tremendously under their leadership. Bishop Williams was highly acclaimed for his city-wide 2ndSunday broadcasts with national blind artist. He was also known in the city as “The Jesus Man”. In 1952 Bishop C.A. Ashworth was appointed Bishop of Alabama and he became pastor of the Smithfield Church. Soon afterward the name was changed from Smithfield to Emanuel Temple Church of God in Christ. In 1971, Elder O.L. 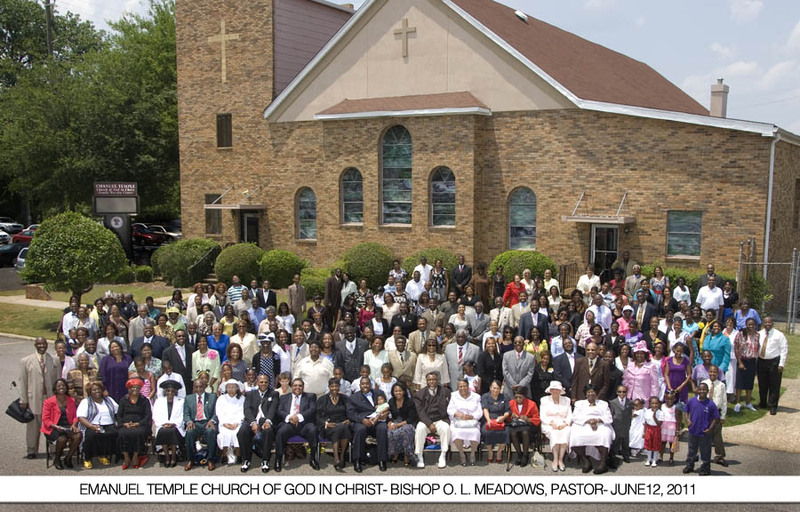 Meadows became pastor of Emanuel Temple and in 1971 he was appointed as Bishop of Alabama Jurisdiction One. There are many accomplishments made by Bishop Meadows. To name a few, the physical structure of the church was renovated inside the sanctuary and bricked. The grounds were given a facelift. God has given him a vision to build a new church and life center. Property has been purchased and cleared to build the O.L. Meadows Family Life Center. Membership has increased tremendously under Bishop Meadows leadership and many souls have been led to Christ.